So when all taxis get into Belfast bus lanes from January 2015, exactly how many vehicles will be jostling with bicycles and buses? In 2013 a high-profile campaign and street protest tried to stop the plan to increase the number of taxis allowed in Belfast bus lanes from 500 to a scary 2,000. When the arguments died down questions emerged about the official figures, suggesting a gross underestimation. A media exposé confirmed something was amiss, and the issue reached the Northern Ireland Assembly. And then, when all went quiet, things got really interesting.. The Department for Regional Development (DRD) consultation on allowing taxis into bus lanes ran during the late summer of 2012. It included figures sourced from the Department of the Environment (DOE) on the number of taxis in Northern Ireland (shown with explanations in Fightback | Taxis in bus lanes). The consultation was pitched as a Northern Ireland-wide issue, but it was effectively a highly-focused Belfast-based policy change, with 99% of Northern Ireland’s bus lanes located in the Greater Belfast area. This meant an accurate assessment of the number of taxis in Belfast, and their concentrated impact on bus lanes, was crucial. The Belfast City Hall protest figure of 2,000 taxis was reached by adding 506 yellow plates and 1,532 green plates together, as presented in the consultation. It was known to be a conservative estimate, as many of the 219 taxi buses were likely to operate in Belfast too. 2,000 then, give or take a few. However in the aftermath of the protest, sources within the taxi industry began to question our figures. It was claimed that the “there are around 4,000 private hire vehicles in Belfast”, with more than 2,000 taxis working in the city while licensed as ‘white plates’. 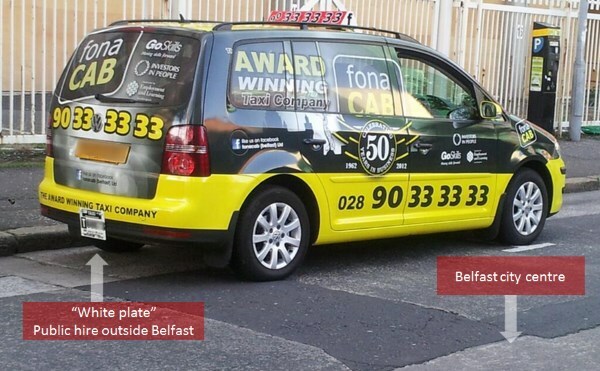 It’s important to note that it’s perfectly legal to operate within Belfast using a white plate licensed taxi, and there is absolutely no deception at work here – sources indicated it was simply down to the way taxis were licensed. It’s not even particularly problematic, save that it masks a potentially brutal impact on bus lanes. Being wary of the unique competing interests of the fractured Belfast taxi lobbies (hundreds of taxis drivers who are already permitted in bus lanes actually support the cycling campaign) caution and evidence was needed. Could this claim really be true? Pennies started to drop looking at the population spread in Northern Ireland. 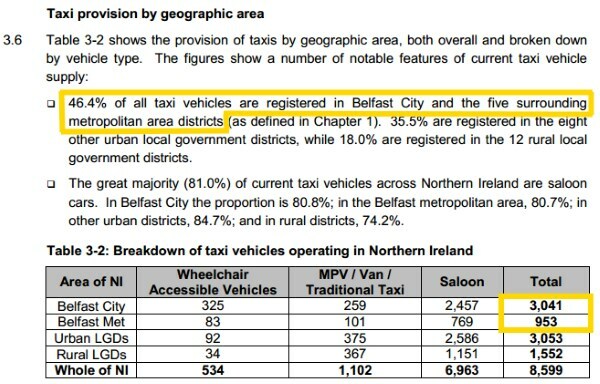 According to the figures gleaned from the DRD consultation, just one fifth of the total NI taxi fleet operated in Belfast, yet the population of the Belfast Metropolitan Area (where all the bus lanes are) was over one third of total population of Northern Ireland. My inner ‘sixth form economics pupil’ began to scream “supply and demand” at this point. 15 taxis for every Metro bus? To get to the bottom of the issue, a provocative graphic was created to give a new perspective. Although buses clearly move the most people in this bus lanes, it was remarkable to many that bicycles vastly outnumbered all other vehicles. The taxi figure of 4,500 was produced by adding 3 taxis categories together (green plate, yellow plate and white/blue taxi bus plate) along with 2,000 white plate taxis, and generously rounded. It left 2 crucial questions hanging – was this the actual number of taxis scuttling about Belfast’s streets, and (if so) should taxis be allowed to utterly dominate bus lanes? The reaction was swift and seemingly decisive. Linda Stewart of the Belfast Telegraph spent an enlightening hour counting taxis passing by St. Anne’s Cathedral, noting their licence plate colour. She observed that a majority of taxis were white plates (51 out of 79) putting DRD’s assessment of taxi numbers in question. Had the consultation exercise left everyone to comment on an unrealistic estimate? “The headline figure of 4,500 appears to be based on a fairly rudimentary calculation .. with an approximation of the numbers of white plated .. the origin of which is unknown .. the use of the estimated ‘white plate’ figure is questionable”. “We are aware of recent press interest in this and wanted to clarify for you some inaccurate information that has been published in some media outlets. In particular, a suggestion has been made that figures put forward in the consultation by the Department in relation to the increased numbers of taxis which would operate in bus lanes have been underestimated and are incorrect. We firmly believe that this is not the case and that, instead, the figures reported in the press are inaccurate and indeed, wholly unrealistic. One article reported that as many as 4,500 taxis would be using bus lanes in Belfast, which includes “2,500 white-plate private hire taxis”. Why this curious intervention by the Big Two? This was an argument between cycle campaigners and DRD over data supplied by DOE. It was a simple case of mathematics – you can’t lobby away an objective measure. But this is Northern Ireland, so anything is possible..
Value Cabs and fonaCAB (while massive companies) don’t represent the entire taxi sector in Northern Ireland. So how could they possibly know the total number of taxis in Belfast, especially if (as was becoming clear) the statutory licensing body wasn’t entirely sure? Was a suggestion of 4,500 taxis that much of a game-changer for public and political opinion that the private hire taxi lobby felt compelled to intervene? And then suddenly, just as cycling campaigners prepared to get stuck in to the issue, everything changed. Taxi reform was halted in June 2013 and the spectre of 4,500 taxis in bus lanes disappeared from view. The debate over the size of the taxi fleet passed out of public knowledge as quickly as it has risen..
Fast forward to today and with taxi access seemingly inevitable by January 2015, this thorny issue remains largely unknown and unresolved. How many taxis actually operate in the greater Belfast area? Luckily in the interim, a DOE-commissioned report “Review of Wheelchair Accessible Taxis in N Ireland” has provided an extremely comprehensive overview of the local taxi sector (in beautiful symmetry) between November 2012 and May 2013. The section which breaks down the Northern Ireland taxi fleet makes for interesting reading..
That’s 6 hacks shy of 4,000 taxis operating in the greater Belfast area according to DOE. And we’re not done yet – this report excludes “taxi buses”, which according to those highly reliable figures in the consultation (219) bumps this total up to over 4,200 taxis operating in the greater Belfast area. So it turns out that our many sources, cycling campaigners, politicians and the Belfast Telegraph were remarkably on the ball with their estimate of the Belfast taxi fleet. Of course not every taxi will be in those lanes when they’re operational, but then neither will all the other permitted vehicles. What matters is the massive increase in taxis to skew the ratios and outnumber all other users combined – truly we could rename these spaces ‘taxi lanes’. We campaigned against 4 times the current number of taxis getting into bus lanes – DRD said around 3 times more taxis would be the impact, and now we can be clear that there will be.. Does DRD still stand over the “3 times” increase assessment? How flawed was the consultation process especially given 86% of people objected? Can the Driver and Vehicle Agency actually provide a 100% accurate assessment of Belfast taxis? What work has been done on the impact on Metro / Rapid Transit of 8 times the number of taxis using bus lanes? In the meantime, the graphic below remains the most accurate explanation of how allowing all taxis into bus lanes will affect the balance of transport in Belfast (save for some truly epic increases in cycling in the last few years). After crunching the numbers, the numbers are crushing. This one’s for you Tom..
..how many vehicles with … advanced booking only plates currently operate from private hire companies within Belfast city limits. DOE could have looked at the article above, looked to its own report (quoted above) for an estimate of the size of the ‘phantom fleet’ of white plate taxis operating in Belfast (it’s over 4,000 in case you didn’t already know) but instead the Department which is leading on taxi reform, which wants to revolutionise the taxi sector in Northern Ireland and improve the experience of customers and operators DOES NOT KNOW HOW MANY TAXIS ARE OPERATING IN BELFAST..
Information is not stored on the Taxi Licensing IT system in a way that would facilitate your request for the number of advanced booking only plates currently operating from private hire companies within Belfast city limits. 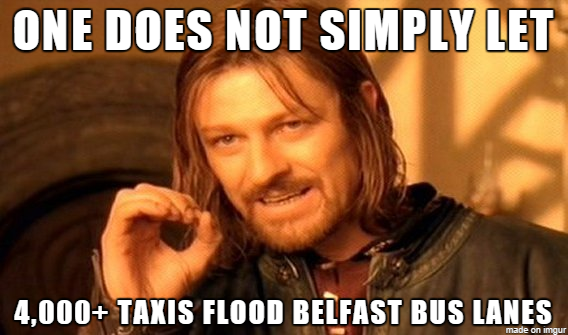 Neither DOE nor DRD are in any position to properly assess the impact of flooding Belfast’s bus lanes with taxis. This farcical situation rumbles on – the absurd Taxis in Bus Lanes policy lies in tatters, but it is STILL being pushed against all will – except that of private taxi firm owners. Take a bow DOE.